Chelsea students, staff, and families have officially started fundraising for our third annual Walk for Learning Differences. On Saturday, April 27, these Chelsea Champions will be walking over two miles—first on their own, then joining with the Hyattsville City Parade—to raise awareness for learning disabilities. All proceeds from this event will directly support Chelsea’s Tuition Assistance Fund, and our commitment to keeping individualized education accessible. 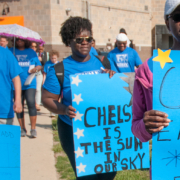 To sponsor a student or staff member, head over to https://www.chelseaschool.edu/walkforld/ and provide a life-changing opportunity!